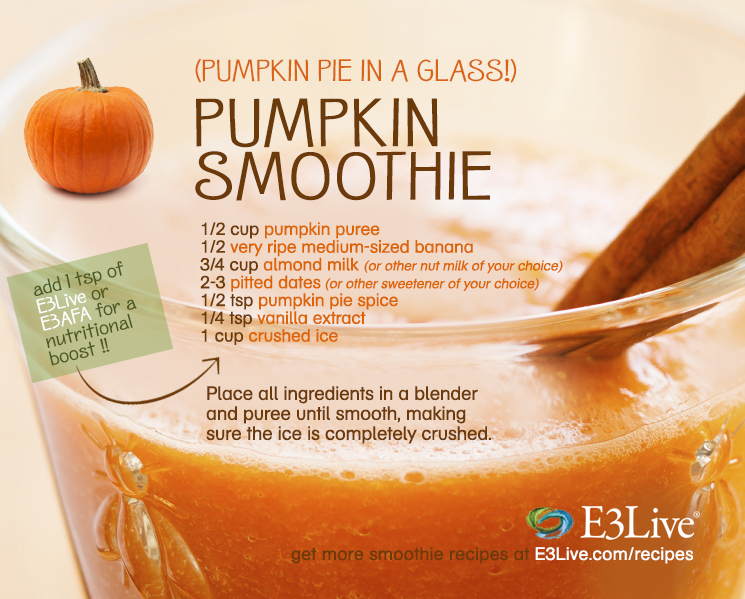 Celebrate the season with a PUMPKIN SMOOTHIE. It’s like a pumpkin pie in a glass. But before you sip it, give the smoothie a nutritional boost. Blend in a tsp of our fresh-frozen E3Live or E3AFA powder (www.e3live.com). Place all ingredients in blender and puree until smooth. Enjoy! We invite you to discover more healthy Recipes! Easy Changes for a Healthier You! Do you ever find that it is difficult to take the time to exercise or watch what you eat? Unfortunately one unhealthy choice in the day can lead to one more.. and then another. While that can be discouraging, the same is true of the opposite! Small healthy choices can lead to other healthy choices in your lifestyle and make you feel better. Some small changes are so simple to add into your routine that you’ll be eagerly looking for new ones. DRINK WATER – This is a quick and simple way to head down the road to good health. If you cut all the soda and juice from your diets (or especially energy drinks!) you are doing several good things for your body. Drinks other than water are often filled with sugar, chemicals and stimulating ingredients like caffeine. Drinking water will help to flush these toxins out of your body and keep you well hydrated. It also cuts out extra calories that you don’t need. Plus, drinking water will help your skin look clearer and feel softer. If you want some flavor try some unsweetened tea or lemon in your cup. TAKE THE STAIRS – If you find that you don’t have the time to go to the gym try taking the stairs. You can also park your car further out in the parking lot and take those extra steps in. All around us are opportunities to walk further and exercise during our day. Every extra step you take is a simple and healthy choice. 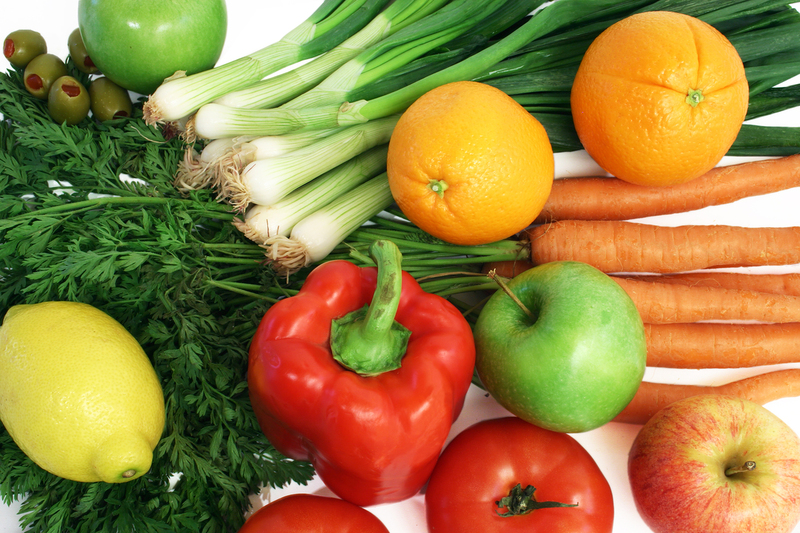 INCLUDE RAW VEGETABLES WITH EVERY MEAL – If your diet isn’t as great as it should be start including raw vegetables with each meal you eat and as snacks. Eat them first to help you feel fuller and prevent overeating. There are many choices available to you and farmers markets are a great place to shop for seasonal produce. If you take the time once per week to package them into individual servings you will have prepared snacks for yourself that require no effort. Carrot sticks, celery, bell peppers and other crunchy vegetables store well after they have been sliced. GET SOME EXTRA SLEEP – We are all familiar with staying up too late. Try to make your bed time fifteen minutes earlier each week until you are hitting at least 8-9 hours of sleep per night. Getting extra sleep will help you be more alert during the day and make healthier choices. You will also be more alert during the day if you are fully rested. TAKE A BREAK FROM TECHNOLOGY – Take a break from sitting at your computer for long periods of time or talking on the phone. If you are starting to feel fatigue or stress get up and move around for ten minutes. The physical activity will clear your mind and ease tension in your body. It will also prevent snacking out of boredom. Small and simple changes can lead the way to bigger ones. With each small change you accomplish add another one into your daily routine. This way nothing is overwhelming you and you can feel good knowing you are living a healthier lifestyle. What are some simple tips you have for healthy lifestyle changes? Tell us in the comments below.